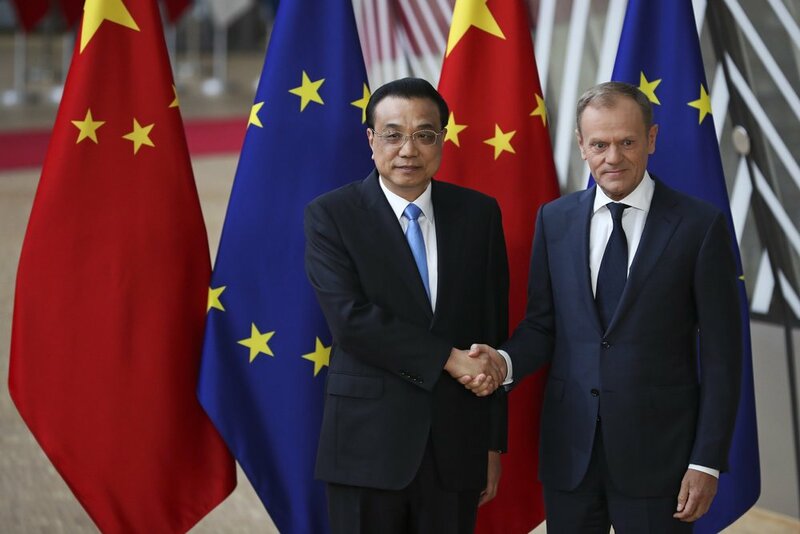 Premier Li Keqiang, left, with European Council President Donald Tusk during an EU-China summit at the European Council headquarters in Brussels, yesterday. China and the European Union agreed yesterday to strengthen their trade relationship, pledging to work toward making it easier for foreign investors to get access to China, the world's second biggest economy. In a joint statement, the two sides said they committed to widening market access and eliminating discriminatory requirements for foreign companies and agreed that businesses should not be forced to transfer their technology _ issues that foreign investors in China have long complained about. The stakes at the annual summit were high, with two-way trade between the EU and China worth around 575 billion euros annually. The EU is China's biggest trading partner, while for the EU, only the United States is bigger. The EU and China also said they reaffirmed the "rules based multilateral trading system'' with the World Trade Organization at its core and plan to intensify discussions aimed at beefing up international rules on industrial subsidies. China wants a bigger role in the WTO and other international organizations like the United Nations and the International Monetary Fund. But China's ample financial support for state-owned companies has been the target of Western trade officials. EU Trade Commissioner Cecilia Malmstrom has in the past called out China for "unfair trade practices'' including government subsidies intended to give its companies a competitive advantage. The summit statement shows "China is willing to make some concessions and that's important,'' said Mikko Huotari, deputy director of the Mercator Institute for China Studies, a Berlin-based think tank. The promises don't mean China will quickly transform from a state-led economy into a market driven one, but "it's about getting back on track with regard to reform promises and ambitions that the Chinese themselves have expressed,'' he said. The leaders discussed China's policy of forcing foreign companies to turn over intellectual property as a condition for access to its big and growing market _ an issue that Washington has also made a centerpiece of its trade dispute with Beijing. The EU in December stepped up a WTO legal challenge filed in 2018 against China's forced tech transfers, calling it a major issue affecting European companies. Li strongly denied that Beijing is behind industrial espionage, saying the government has never called on Chinese companies to infringe intellectual property rights or steal trade secrets.